A gelatin salad — or "congealed" salad — is an essential part of the Southern holiday menu. This blueberry salad is made with a sour cream and cream cheese topping. Drained canned blueberries are used in this salad, but feel free to use frozen wild blueberries instead. You could also use black raspberry or black cherry. The blueberry salad is a nice change of pace from a cranberry salad or other types of congealed salads. Dissolve the gelatin in boiling water; stir in reserved pineapple juice. Chill until slightly set, about the consistency of unbeaten egg white. Stir in pineapple and blueberries. Pour into a 9 1/2 x 6 x 2-inch pan; chill until firm. In a bowl, combine sour cream, cream cheese, and sugar; mix well until smooth and well blended. 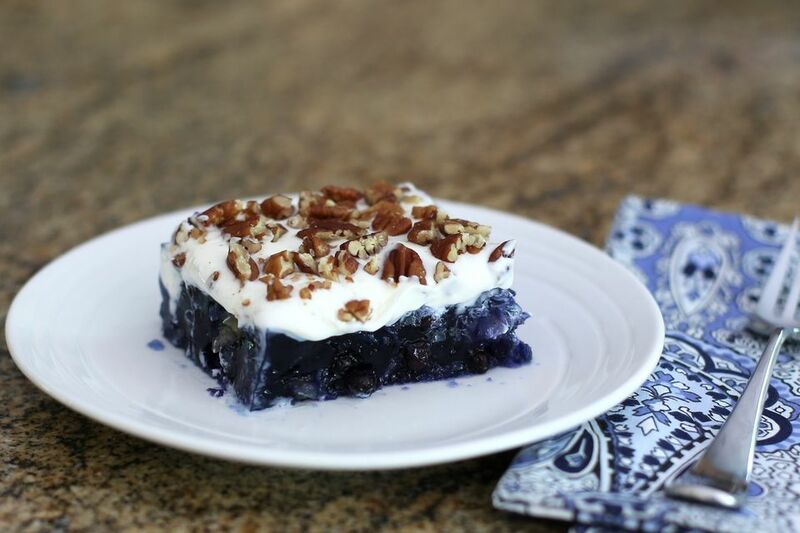 Spread over blueberry salad and then top with chopped pecans or walnuts. Chill the gelatin layer thoroughly before you add the topping. The blueberry salad should be made and refrigerated at least 3 to 4 hours before serving.